For many decades, in the days before air conditioning, the St Lawrence cruise season ran all summer long. From 1919 until 1965, Canada Steamship Lines offered weekly Saguenay cruises from Montreal, with a season that ran from June to September, even during the war. From 1921 to 1961, the Clarke Steamship Company offered longer “Round the Gulf” and Labrador cruises in a season that ran from May through October. After these services closed, Cunard Line, the Baltic Shipping Company, Polish Ocean Lines, Moore-McCormack Lines and the Greek Line, among others, began offering week-long cruises from Montreal or 10/11-night cruises between New York and Montreal. 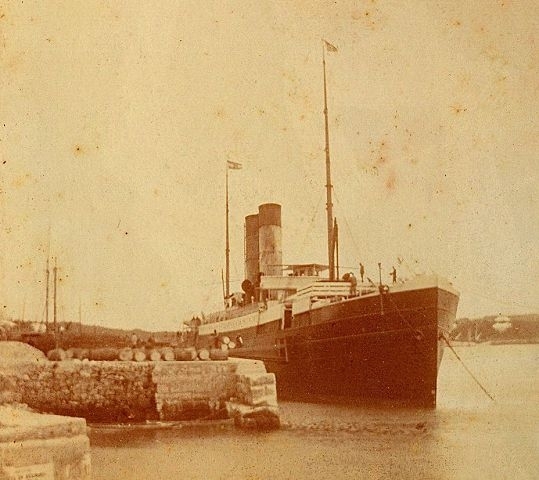 A pioneer of St Lawrence cruising from 1908 until the First World War, the s.s. Trinidad cruised the St Lawrence by summer and sailed from New York to Bermuda in the winter. The Quebec Steamship Company’s 2,162-ton Trinidad followed in 1908, the 300th Anniversary of the founding of Quebec. In 1919, this line was acquired by Britain’s Furness Withy & Co, who cruised first the 5,530-ton Fort Hamilton and and then the 7,785-ton Fort St George from New York to Quebec. Between the wars, the Anchor Line, Canadian Pacific, the Clyde Line, White Star Line and others all offered cruises between New York, the Maritimes, Quebec and Montreal. These cruises were nearly always offered in the high season in July and August, when it was hottest in the cities, as a getaway from the summer heat. More recently, however, the so-called Canada New England brand has suffered in that even The Sunday Times now tells people who want to cruise the St Lawrence to go in the autum. The question is, is this the propogation of a myth or is it simply because cruises only go there now in the autumn? This has been one of the biggest challenges facing St Lawrence and New England destinations in recent years, but things are slowly starting to change. In recent years, Holland America has operated one ship, the 1,266-berth Maasdam, into Montreal between May and October. Starting this autumn, however, it brought a second ship to the St Lawrence, in the 1,348-berth Veendam, which it had previously been operating on the New York-Bermuda run. Next year, Holland America will operate the Veendam on a full season of St Lawrence cruises, from May through October, turning at Quebec while the Maasdam continues to turn at Montreal. When sailing to Bermuda she spent most of her time outside the 200-mile ECA limit but by sailing to Canada she will always be within it. This means she will have to burn more expensive distillate fuel in order to reduce sulphur emissions, something that Holland America has already estimated increased their fuel costs by 40% in the Alaska trade, which is also completely within the ECA, for an extra $200,000 on a 7-night cruise. The Veendam will handle four embarkations and four disembarkations at Quebec, bringing more than 20,000 extra visitors a year over a three-year period. Under the new marketing agreement, Montreal will also see additional turnarounds from the Maasdam in July and August. This program, announced last month, is backed by $1.15 million in government funds, half from Tourism Quebec and half from Quebec City. Holland America has become a bit of a pioneer in the St Lawrence. It was the first cruise line to visit Sept Iles, on the St Lawrence North Shore, when it sent the Maasdam there in May 2009. This in itself was an earlier season start than usual for the St Lawrence, the call having been made during a positioning voyage from Fort Lauderdale to Montreal, something it will offer again in 2013. The new $20 million berth at Sept Iles now accepts cruise ships of up to 985 feet in length. Fellow North Shore ports Baie Comeau to the west and Havre St Pierre to the east have also added cruise facilities and their proximity to Gaspé on the South Shore, Charlottetown in Prince Edward Island and Corner Brook in Newfoundland, offers a choice of half a dozen cruise ports in the Gulf of St Lawrence below Quebec. 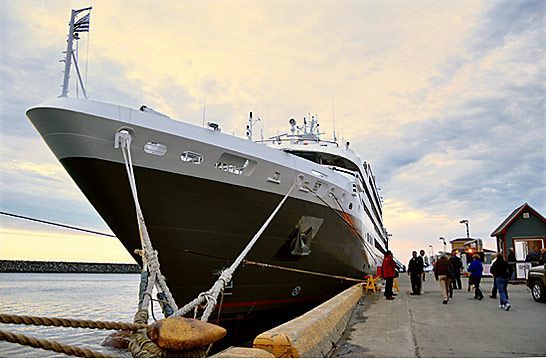 The Magdalen Islands, which has its own weekly cruise ferry from Montreal and is now also visited by Compagnie du Ponant and Crystal Cruises, adds a seventh. Crystal Symphony seen here calling at Quebec, offers a round-trip Gulf of St Lawrence cruise from Montreal each September. On September 30, Crystal Cruises operated a 7-night round trip from Montreal with its 960-berth Crystal Symphony. Three of her four ports, Sept Iles, the Magdalen Islands and the French islands of St Pierre et Miquelon, were first time calls for Crystal. The fourth port, Quebec, has been rated as the most popular cruise port in North America. This Montreal round trip itinerary will be repeated on September 26, 2013. 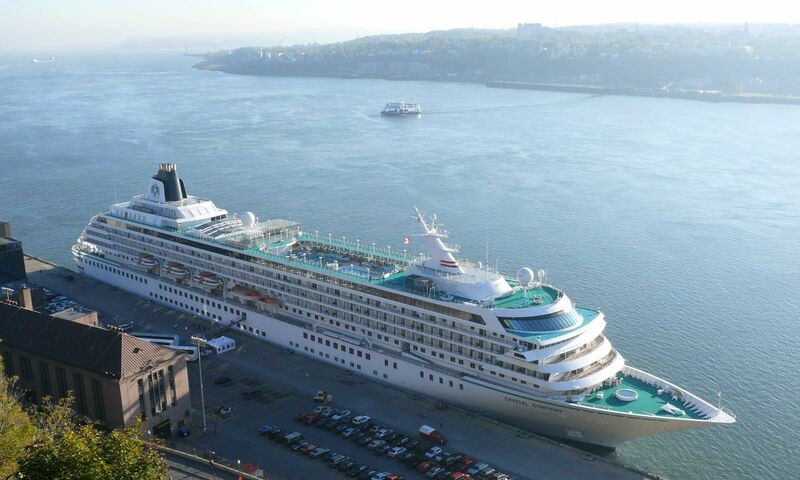 But in September 2014, the cruise will be offered by the Crystal Serenity from Quebec. A larger ship than Symphony, the Serenity can’t get under the Quebec Bridge to sail upriver to Montreal. Royal Caribbean has also started operating turnaround cruises from Quebec with its 2,112-berth Brilliance of the Seas, with a typical 10-night cruise taking in Baie Comeau, Corner Brook, Halifax, Sydney, St Pierre et Miquelon and Charlottetown. Like the Serenity, the Brilliance is too tall to fit under the Quebec Bridge. Other St Lawrence visitors this season have included the 3,114-berth Emerald Princess, 2,104-berth Eurodam, 264-berth Le Boréal, 2,476-berth Norwegian Dawn, the 2,620-berth Queen Mary 2, the 684-berth Regatta, 490-berth Seven Seas Navigator, 388-berth Silver Whisper and the Veendam, nearly all in September and October. Not to mention the Aida, Fred Olsen and Saga ships that cruise over from Europe. For more details on Cruising the Gulf of St Lawrence please call The Cruise People Ltd in London on 020 7723 2450 or e-mail cruise@cruisepeople.co.uk. For some time now the Canada New England trade has been suffering from the misperception that it is best to go there in September and October for the “autum leaves,” when in fact the region enjoys a wonderful spring and summer season starting in May. This week, we look at how Holland America is leading the way to extending the cruise season at Montreal and Quebec, while others such as Crystal Cruises and Royal Caribbean are starting to offer round trip cruises from these ports. Meanwhile, after the demise of Classic International Cruises, the Australians are looking at phasing out their Travel Compensation Fund, but with what replacement? Elsewhere, two more Royal Caribbean brands, Azamara Club Cruises and Pullmantur, are adopting blue hulls and new colours. In 2010, the Ocean Liner Society chose Croisières de France and its 37,301-ton Bleu de France (delivered 1982 as Hapag-Lloyd Cruises’ last Europa) for its annual group cruise. This cruise proved such a success that in 2012 the Society returned to Croisières de France in its 46,811-ton Horizon. In 2013, however, the Society will return to another former Hapag-Lloyd ship, this time the 15,067-ton MS Hamburg, which betwen 1997 and 2012 operated as Hapag-Lloyd Cruises’ Columbus. The 2013 cruise will take in a North Sea itinerary, departing Hamburg on Monday, 27th May for a five-day four-night cruise to Sylt, Borkum and Helgoland, and a transit of the Kiel Canal before arriving at Kiel on Friday morning, 30th May. Here are some things to do in Hamburg before sailing. For more than two decades between 1991 and 2012, Plantours + Partner operated the 7,478-ton Vistamar, which had been rebuilt in 1989 from the Spanish ferry Santa Cruz de Tenerife. Indeed, several Society members have cruised in her. 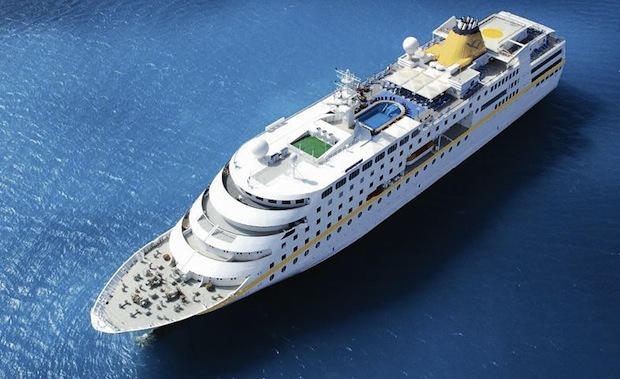 The MS Hamburg, which has replaced the Vistamar, carries 400 passengers compared to the 299 in the earlier ship – twice the tonnage but only one-third more passengers, for a respectable passenger space ratio of almost 38 tons per passenger, compared to 25 on Vistamar. The MS Hamburg was built by Mathias-Thiesen Werft (MTW) at Wismar, Germany, in 1997 as the Columbus, a ship whose design originated from a desire by Hapag-Lloyd to re-introduce cruising into the Great Lakes of North America. Indeed in her fifteen-year career with Hapag-Lloyd, the Columbus completed eleven seasons in the Great Lakes. She also undertook a world cruise every winter. After Hapag-Lloyd acquired a larger ship to replace the Columbus Bremen-based Plantours took her over, renaming her MS Hamburg at a ceremony in the old Hanseatic port of Hamburg in June 2012. Plantours is a wholly-owned subsidiary of the Venice-based Ligabue Group, which was founded in 1919 by Anaceleto Ligabue, who began supplying food to the Società Veneziana di Navigazione a Vapore, a company whose fleet was absorbed into Italia and Lloyd Triestino in the 1930s. Today Ligabue is active in shipboard catering and river cruising, with a total of fourteen managed vessels, and also supplies catering services on board the cruise ships Aegean Odyssey and FTI Berlin. OLS group fares are valid for a minimum number of cabins, and there is an allocation of cabins available for singles. Bookings can be made through the OLS group agent The Cruise People Ltd in London. Fares include passage, full board and port charges. A special drinks package is available for €52 per person (very good value at only €13 a day). Fares are cruise only, per person in double occupancy or single as indicated, and include port charges. Drinks package available for €52 per per person. OLS Group fares include an allocation of single cabins. Extra cabins beyond our allocation will be subject to availability. A deposit of 25% will confirm a reservation. Members of the general public can qualify to travel on this cruise by joining the Ocean Liner Society. Membership is £20 in the UK, £23 in Europe and £25 in the rest of the world. As well as the opportunity of joining OLS group cruises, this includes a subscription to their 48-page quarterly journal, Sea Lines. Further details can be found at http://www.ocean-liner-society.com. Elsewhere, with cruise seasons just finishing, the news is mainly from the ports. Vancouver will see a rise of more than 20% to more than 820,000 passengers next year, caused mainly by the return of the Disney Wonder. Boston set a record in 2012 with 380,000 passengers, brought about because of the arrival of the Carnival Glory for cruises to Canada. And Houston will be getting two new ships in 2013-14, with first the Caribbean Princess and then the Norwegian Jewel. For something different this week, we look back thirty years. Examining the third weekend of January, at the start of the Caribbean high season in the traditional cruise trades from Florida and Puerto Rico, we compare what is on offer now to the same weekend in 1982. Last week, we announced that Classic International’s Australian arm had succeded in finding a replacement ship for the arrested Athena. This announcement appears to have been premature, however, as only two days later Classic’s Australian went into administration. Finally, we look at what would normally be considered a hare-brained idea – a passenger liner service between Europe and Australia – although the design for the two ships is reportedly to be entrusted to one of the world’s pre-eminent naval architects.